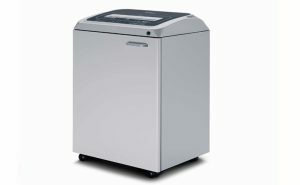 Kobra 245 TS Straight-cut "Touch Screen" Office shredders are designed with the most advanced technology to Shred up to 29 sheets of paper (A4 70 gr.) at a time, CDs, DVDs, credit cards, with Touch Screen Panel with LED indicators, "ENERGY SMART®" power saving system: machine goes into power saving stand-by mode after just 8 seconds and switches off automatically after 4 hours of non-operation, 24 hour continuous duty motors: no duty cycle or timed cool down periods, Heavy duty chain drive with steel gears "SUPER POTENTIAL POWER UNIT", Carbon hardened cutting knives unaffected by staples and metal clips, New high precision design of cutting knives allows high shred loads with low power consumption. Available with all security levels from 2 to 6.